Discussion in 'Big Chris Custom Knives' started by Big Chris, May 23, 2016. Excellent news, so funny about kids comment though. Been trying to clean up the trigger on my CZ P-07 every night for the last week, but homework, baths, making lunches and then downtime from previous take up almost all available evening energy. Exactly. Our 2 oldest are in K and 1st right now, third starts preschool in after Labor Day, and the youngest is walking very efficiently now so I can not take my eyes off him. P-07 is a great pistol, BTW. I love mine and if all goes well I have plans to go shoot this weekend. 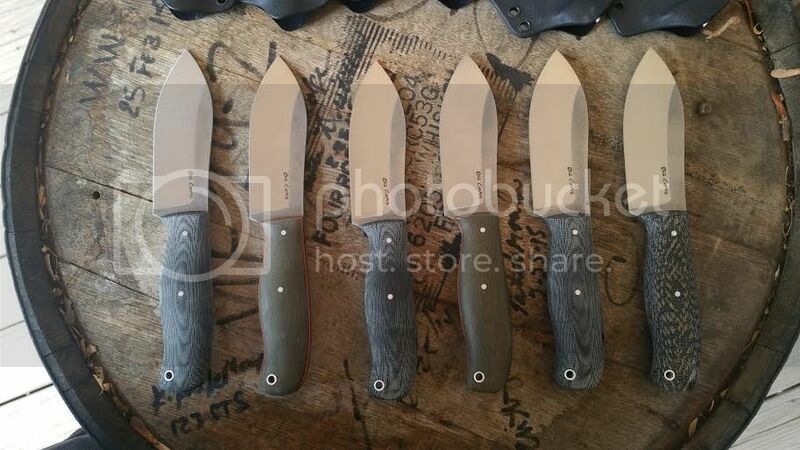 Sheaths are finished and blades are roughly sharpened. Will refine the edges tonight. What a great knife. I can't wait to put mine through some camp chores. I'm trying to wait for it to cool down a little. So who has one of these they are ready to sell/trade me?